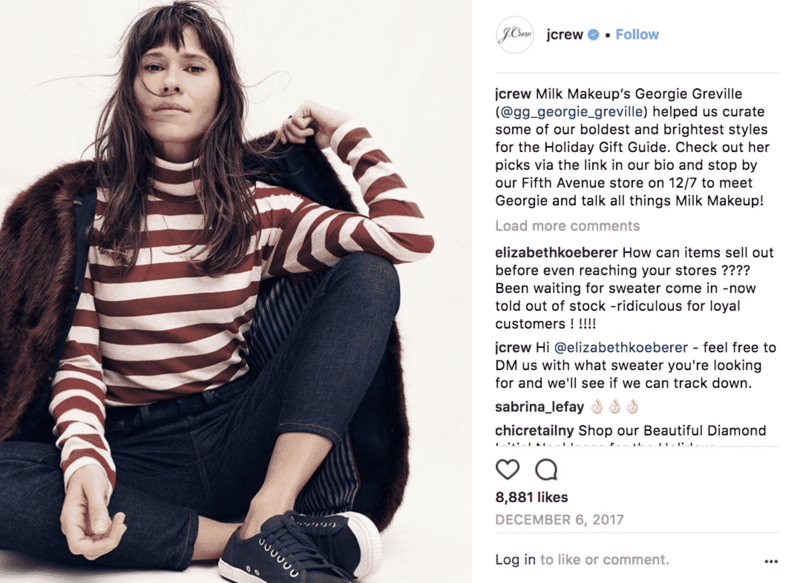 Top fashion brands have wholly embraced Instagram as an integral part of their social strategy. So much so that Tommy Hilfiger debuted an “InstaPit” at 2016’s New York Fashion week where famous and highly followed Instagram influencers could get unobstructed shots of the new collection. Why Instagram? What better platform for an image-based industry than one that’s completely driven by photographs? 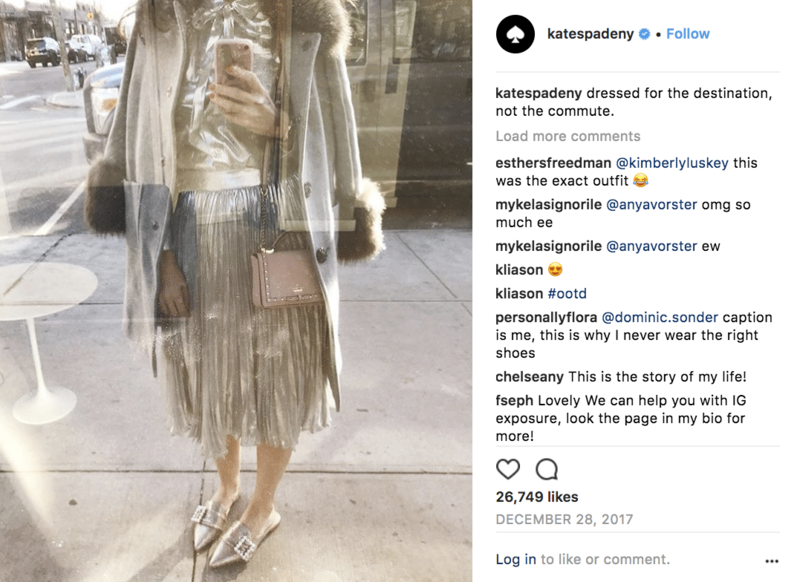 It was a natural progression, and an easy move for fashion brands to bring their wares to Instagram. But once they saw the potential of the network, things got interesting. Now, smart fashion brands are using Instagram to give followers a sneak peek behind the scenes at fashion shows and instant access to the latest fashions on the runway. They’re connecting with followers by showing personality along with their clothes, and they’re letting the rest of us in on what was once a very exclusive world. And they’re selling a LOT of products while they’re at it. According to eMarketer, by 2018, Instagram’s global mobile ad revenues will surpass $6.8 billion*. And our recent Shopper Story report revealed that 70% of US shoppers frequently make impulse apparel purchases online, so filling fans’ Insta feeds with the hottest new clothes is a surefire way to drive sales. 1. Burberry: Spotlight the makers. 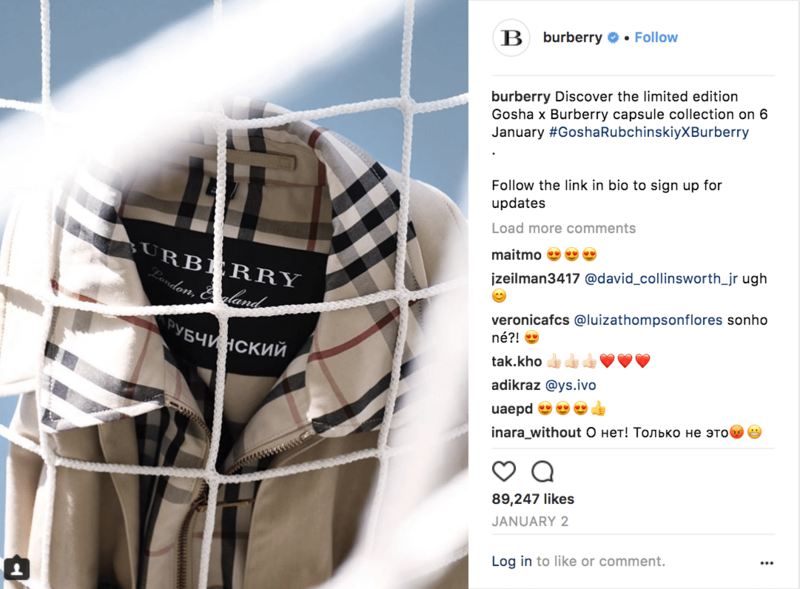 A wonderful example of the union of fashion and art, much of the Burberry Instagram features collaborations with artists, and goes beyond the clothing to highlight the artists themselves. Plenty of shots of the fashion elite, models, and celebs wearing their clothes at shows and parties also keep things interesting. 2. Free People: Add some whimsy. As you would expect, “carefree” is the dominant vibe on the Free People Instagram. Adorable pet pics, a breezy tone, and some styling tips like their story on the art of the “tuck” make it a welcome addition to your feed. This brand clearly understands that cute animals + fun quotes = tons of likes and comments. 3. 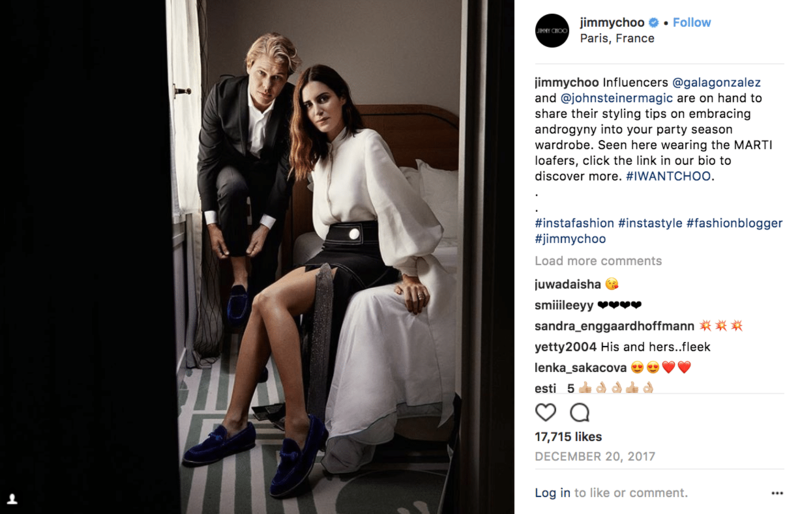 Jimmy Choo: Team up with digital fashion influencers. Jimmy Choo’s posts mostly read like a catalog but the brand isn’t as old-school as you might think. Case in point: their Style Challenge Series, where they team up with top digital fashion influencers and style bloggers, tackling topics like “Office Style that Works for You”. 4. Nike: Motivate with pictures and video. 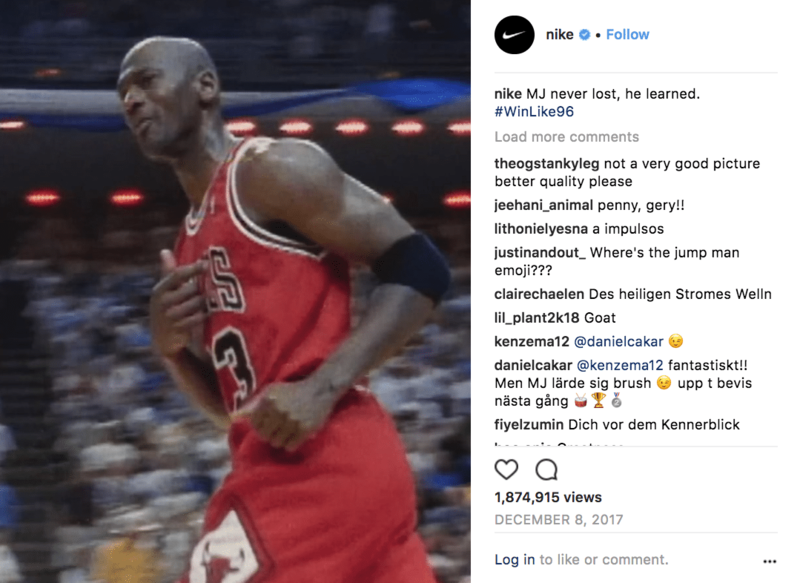 Nike’s feed accomplishes many things: product promotion, shout outs to professional athletes, and inspiration for everyone who needs a little push to “just do it”. It celebrates the accomplishments of famous and regular people everywhere and its heavily video-focused feed keeps you watching. 5. Kate Spade: Get personal. 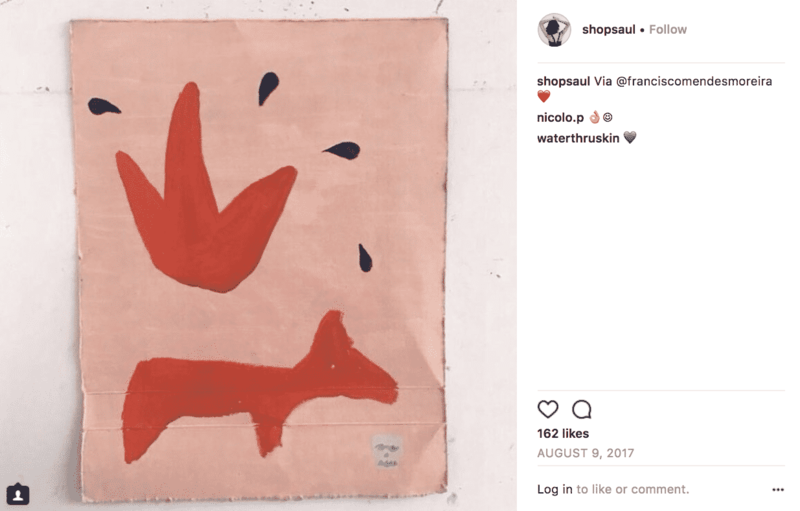 Kate Spade’s Instagram is bursting with personality. It’s a great mix of product and fun, with a few videos, celebrities, and giveaways thrown in. The conversational tone and the idea that bags are only part of what makes Kate Spade simply charming. 6. Shopbop: Tag your way to more followers. 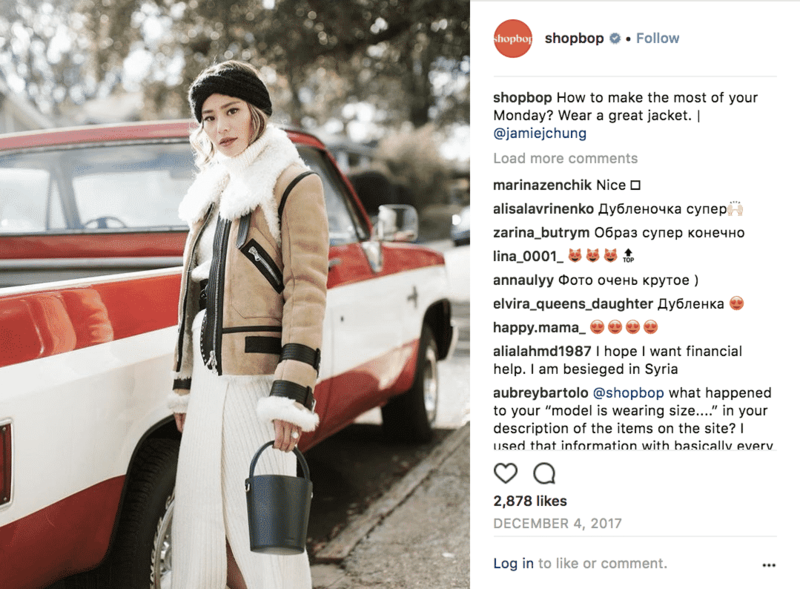 Shopbop is another brand that mixes product content with lifestyle content for an easygoing feed that keeps followers engaged. Smart tagging of influencers also helps spread the love and grow their following. 7. J. Crew: Make it shoppable. J. Crew masterfully uses stories to highlight collections, and a simple swipe up takes you right to the store to shop the looks. Other smart Instagram tactics include style hack videos with a Milk Makeup “guru”, and the #castmejcrew hashtag for a chance to be featured in a photoshoot. 8. Zara: Celebrate the arts. 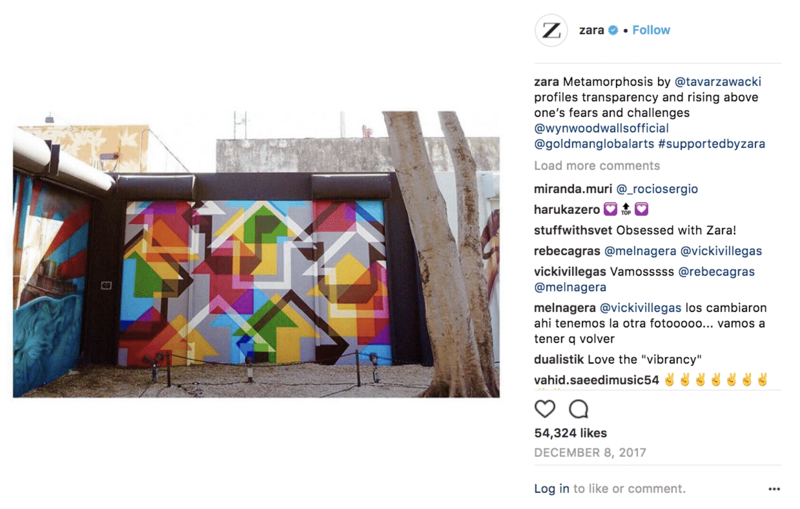 Like Burberry, Zara scores points (and followers) by supporting the arts with its #supportedbyzara tag, which features artists who are collaborating with the brand. 9. Shop Saul: Mix in non-self-serving content. Shop Saul is one of the smaller brands on this list, but they make the cut thanks in part to their unique mission (sustainably made, limited edition clothes with lots of style) and their refreshing mix of content. Posts are short, sweet, and diverse with travel, art, and unique photography pics making up a significant portion of their feed. Adding credits to photos for “shot by”, “styled by”, and “model” are also smart ways to thank their supporters and widen exposure. 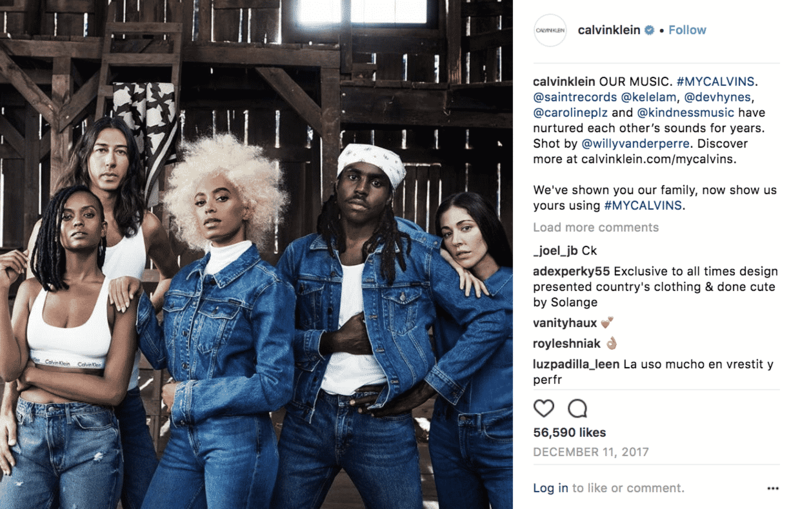 Building on the successful “My Calvins” campaign from the 80’s, Calvin Klein’s wildly successful #MyCalvins hashtag on Instagram has generated more than half a million posts. That’s a lot of free Calvin Klein endorsements. Celebrity collaborations and posts of celebs in their duds bring it home for the marketing win. 11. Gucci: Make it look like nothing else. Gucci’s Instagram account looks more like a fine art museum than a high fashion brand. To call it eye-catching and interesting is an understatement. 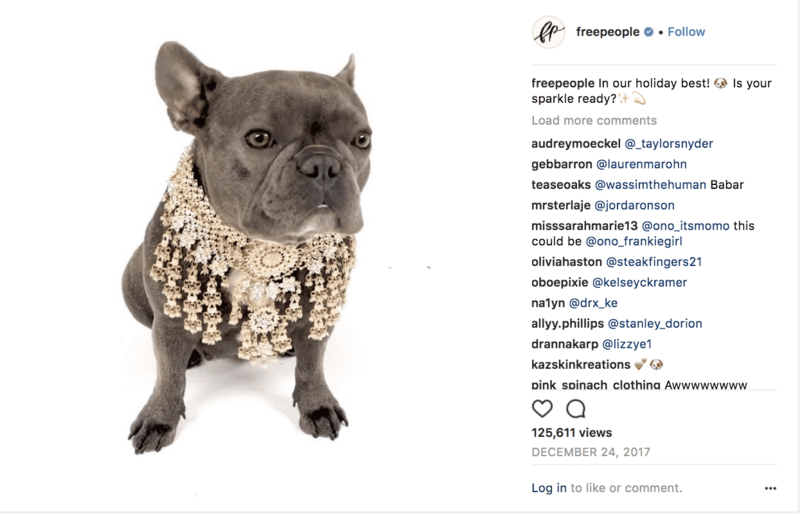 Gucci is also a good example how to use Instagram as a resource, in addition to a marketing tool. 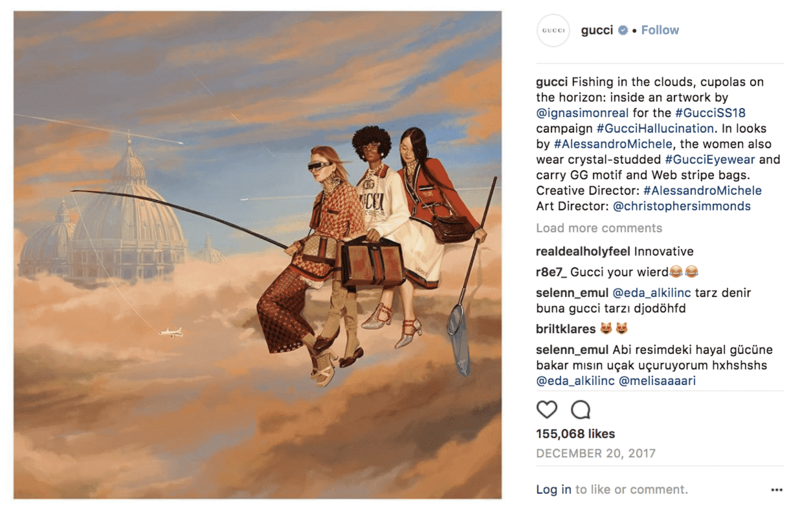 The story goes that their creative director discovered an illustrator on Instagram, who ultimately began creating illustrations for a line of Gucci T-shirts. 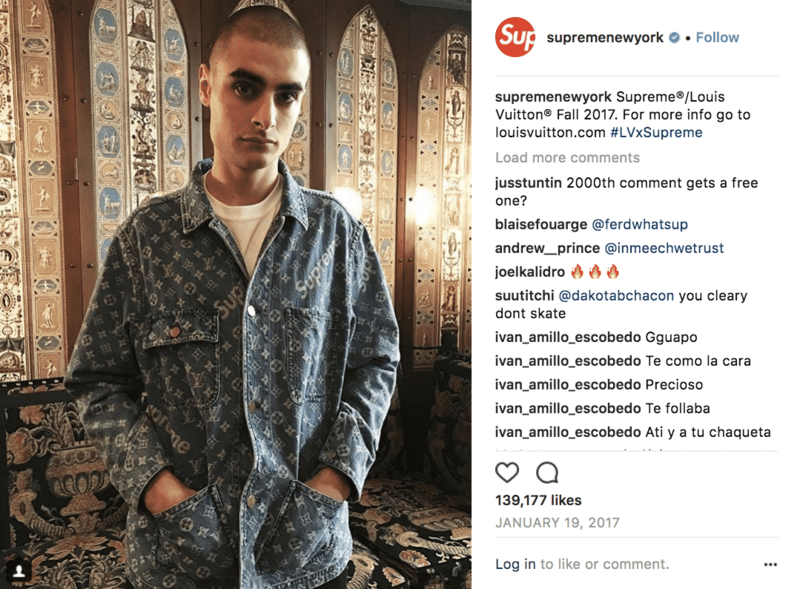 How did Supreme add 4.8 million Instagram followers in 2017? Being one of the hottest, most coveted streetwear brands helps, as does the collaboration it announced earlier this year with Louis Vuitton (which just so happens to have 20.4 million Insta followers). Not quite ready to create an Instagram account that can compete with these? Try dynamic retargeting ads on Instagram. With about 800 million users (and counting), Instagram is an extremely valuable channel for retargeting campaigns. Re-engage shoppers that are most likely to buy with highly personalized ads and you could see a sales uplift of 12% or better. Here are three of our favorite success stories when it comes to great social retargeting campaigns. **Fashion fans follow 100 brand accounts stat source: Chen said. “Most fashion followers follow 100 brand accounts, minimum. If you post once a day, you’re missing your girl and you won’t be seen.